On a rooftop, the Turtles are engaged in a little “friendly competition”. Raph challenges Mike to make it to 14 North Moore Street and back in 9 ½ minutes, with the stakes at double or nothing. After a little goading, Mikey takes the bet and dashes off. Sprinting through alleys and leaping over rooftops, Mikey makes it to the target and finds proof of arrival hidden in plain sight: a coin tucked beneath an old bean can. Meanwhile, at the finishing line, Raph, Leo and Don laugh that Mikey will never find the coin in such an obvious hiding place. 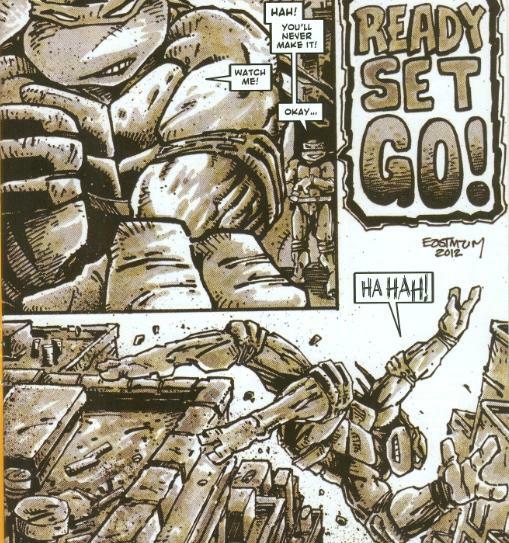 Mikey arrives at the last second, reminding Raph not to underestimate him. Having won the bet, Raph now has to do dishes every night for two weeks. Undeterred, Raph offers a new bet to Leo and Don: 9 minutes flat, double or nothing. *This story was reprinted in 2014 in the TMNT 30th Anniversary Special. *The TMNT 30th Anniversary Special includes an introduction, placing this story in the Mirage universe rather than the IDW universe. Specifically, the "Early Mirage" era. 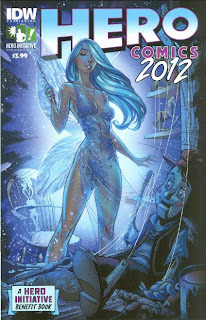 *This issue also contained 7 other unrelated short stories. This was one of the nicer surprises that IDW managed to get to the shelves this year; the last thing I was expecting was a brand new 4-page TMNT story written and drawn by Kevin Eastman! They announced the story some while back and it’s been a bit of a drag waiting for the release date (Hero Comics 2012 got pushed back a few times, I think, and issues weren’t distributed in all markets on release day). What I love about this story is that it looks and feels like something that you’d see in “Shell Shock” or as a back-up in a TMNT (Vol. 1) issue. It is very vintage and straight-up classic Kevin Eastman. If this thing had been hand-lettered instead of digitally lettered, you’d be hard-pressed to tell the difference. Of course, if this had been a story released back in 1989 when Eastman was churning out these back-up TMNT strips by the fistful at an expedient rate, I’d probably be less enamored with it; it’s really just a short gag piece about Mikey on a scavenger hunt. However, I think what makes it feel so special is the context of its release. 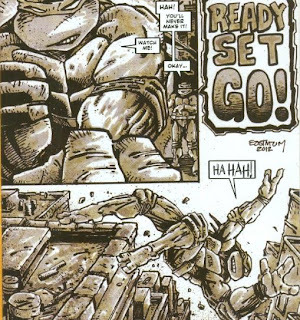 Eastman hasn’t written and drawn a TMNT story in I don’t know how long. After he sold his creative rights to Peter Laird so he could focus his time on Heavy Metal magazine and its offshoots, Eastman’s contributions to TMNT became slimmer and slimmer. He released his Artobiography which was cool, and using his Heavy Metal imprint, he gave us a new printing of “Bodycount” as well as an anthology collection of his classic work in “TMNT 25th”. But anything new was strictly the stuff of sketches for at least ten years or more. So seeing him doing a new story, as uneventful as the actual plot of said story may be, is genuinely thrilling and nostalgic. In fact, it actually leaves me considering snatching up the hardcover collection of IDW’s first four issue arc of TMNT, as it contains the full Eastman layouts for those issues. A bit pricey, though; I’ll have to mull it over some more. is this the one you wanted to link? The url is the one the site owner sent me when he asked me to link to him. He must've changed his address and then a less scrupulous individual snagged the domain. Fixed now, whatever the case. 14 North Moore Street is the Ghostbusters firehouse. :) Very cool!